at Susan Atkins' Compassionate Release Hearing. “I’m speaking on behalf of Janet Parent. 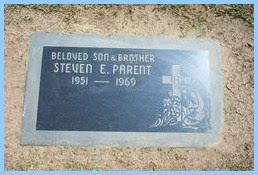 Her brother Steven Parent was the first victim of the Manson murders at the Sharon Tate house. My name is Lynn Mathews and I’m reading this letter on behalf of Janet. To the members of the parole board I will start of by saying that Susan Atkins is a cold blooded murderer. 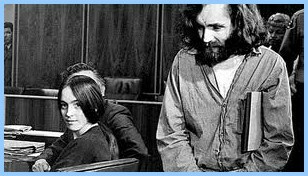 She was and still is one of the most dangerous and callous murderers of the Manson girls. Her murderous rampage will always remain in my memory. She originally sentenced to death penalty but was given chance to live by the abolishment of the death penalty. Why should she be given another opportunity to live with her family and friends when my brother has not had the chance to see his nieces and nephews, to get married and have children of his own, to live his life. Please remember, yes, she may have been a model prisoner, and, yes she may have taken college courses and may have done everything asked of her during her parole hearings in the past. But that doesn’t change the fact of what she has done to my family. It’s just not fair. My children have had to struggle to go to college because I could not afford to pay for it but hers was paid for by tax dollars. My children did not get the opportunity to spend many happy years with their uncle. There are so many things I could go on about. She’s had more opportunities that a murderer should never have had. So please remember that she had a trial and was sentenced to death. In Susan Atkins’ case it looks like she does not have long to live. If she were given a compassionate release, this would set a precedent for the others. Where do you draw the line, a line needs to be drawn. In closing there is one more issue I would like to address. I don’t think the perpetrators of these crimes realize the lasting effect this has had on the victims’ family members. Because of how heinous and infamous these killings were, each time a parole hearing comes up, understandably the media is all over the case wanting to cover the story. But I wonder if these Manson Family members realize how painful this is for the victims’ families to go through this time and time again. Wouldn’t true remorse show a willingness to take full responsibility for their crimes? In taking responsibility, wouldn’t this include denying themselves any chance of parole. Therefore completing the sentence handed down to them. For the victims’ family members to hear the crime details brought up again and again at these hearings, is causing their wounds to never heal. These families have already suffered so much. I wish the parole board would consider these things in their decision. I don’t wish suffering on Susan Atkins with this horrible illness but do want the suffering to stop for my family, the family of Sharon Tate, Jay Sebring, Voytek Frykowski and Leno & Rosemary LaBianca. Please for our families, could you show compassion for us?" Oh god, that is so very sad. Forty years gone and it doesn't end for the families...it never does and it affects the generations to follow. I just cannot fathom how it must be to have the pain dredged up by outsiders looking for a story. Over and over again, parole hearing after parole hearing with the multiple killers, year after year, decade after decade. I feel guilty this night/morning reading this...does anyone else feel that way at times? Like we're somehow feeding off of someone else's misery...? Of all the victims in this case, I think Steve Parent's murder was the saddest. No matter what motive you come up with, Steve had nothing to do with any of them. 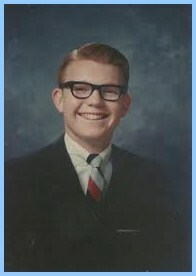 He was working 2 jobs to pay for his college tuition and was all set to start in September 1969. He was just in the wrong place at the wrong time. To me, Steve's murder was proof that Tex just wanted everyone dead, regardless of money or drugs. The pain just doesn't end for the families of the victims. I can't imagine what it must be like for them to have to go to these hearings all the time. I have such sympathy for them. Reese, I know what you mean. Sometimes it seems like we're eavesdropping (for lack of a better description), doesn't it? I know, Katie...that's a heartbreaker, isn't it? I've thought...*how many times did I just stop by a friends's house/apt for no reason except I saw they were home. The only thing in my life that comes close to this case is a friend who went missing 30 years ago and I recall so vividly how the press insinuated she was a bad girl because she occasionally smoked weed and occasionally got drunk and was on birth control at age 17. It wasn't as vicious as the allegations these families had to deal with...the satanic angle, the drugs, the Steve-hooking-up-with-Garretson...but it was devastating to my friend's family and friends. They never really did recover and really, how could you? GENEVA — Forget the seven Tour de France victories. Forget the yellow jersey celebrations on the Champs Elysees. Forget the name that dominated the sport of cycling for so many years. "Lance Armstrong has no place in cycling and he deserves to be forgotten in cycling," said Pat McQuaid, the president of the International Cycling Union. "This is a landmark day for cycling". The condemnation by cycling's most senior official confirmed Armstrong's pariah status, after the UCI had backed Armstrong at times in trying to seize of the doping investigation from USADA. McQuaid said the UCI endorsed a life ban for Armstrong after almost two weeks studying the American agency's evidence, and will meet Friday to discuss going after his 2000 Olympic bronze medal. What are the chances of dropping by a friend's house to sell him a clock/radio and getting mowed down by hippy killers on your way out? The chance of getting struck by lightning must be greater. i wonder when Tex's children hit the 18 year old range if he spent any time thinking how he would feel if someone were to murder them. Bobby good question. I think Tex has developed a nifty way of forgetting about all his sins. It's called being "born again". LOL. if Bobby, Susan and Mary had walked away from Gary's on that last day and let him live, and Gary had gone to the police, what would Charlie have been looking at for a sentance for slicing Gary during a robbery? And what would Bobby and the girls have been looking at? I am guessing Manson would have been looking at 15-20 and the other three like 7-10. Am I in the ballpark? This may not be the best place for this comment. I was just looking at pictures of Steven Parent, in every single one of them Parent is wearing a pair of glasses, except for 1, the one where he is lying dead, apparently in the morgue. There was a pair of glasses found in the Tate house that apparently were never identified. Apparently, a pic of them can be seen on another blog HERE. They look a great deal like the glasses Parent was wearing in several pix. 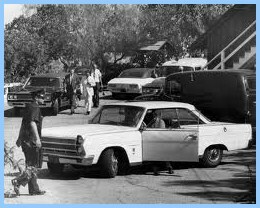 and "repositioned" them to inside the Tate house as Manson family members apparently did often on other "creepy crawl" missions? Possibly, to make it look like some type of murder/suicide blaming Parent? I'll admit this is a long shot that in the 40+ years the police, Parents family, or Manson family members haven't made the connection or mentioned it. Does anyone know if Parents glasses were recovered in the car with him the next morning? Sunset, good eye! The first Tate homicide report doesn't mention any glasses being found in Parent's car. The glasses found on the steamer trunks belonged to an extremely myopic person. So myopic that without glasses, the person would be almost blind. I don't know Parent's level of myopia. He was photographed without glasses in the morgue, but I would imagine that morgue photogs don't include glasses in their photos. I do know that Charlie went back to Cielo Drive after the murders and could well have moved those glasses to the steamer trunks in the house. Charlie has admitted that he went back. I don't think Tex or any of the girls were of any mind to think of this. Another source says the person who accompanied Charlie to Cielo Drive brought some glasses with them to throw off clues. Glasses that were used to fry ants because they were so magnified. If Charlie did move those glasses to the steamer trunks, I doubt that it was to blame Parent. Forensics confirmed that he died first. I think it was just to throw everyone off on clues. BTW, if those glasses did belong to Parent, then the LAPD really botched that up. They should have shown those to any family members of the victims for verification. Oh, forgot to add....if Charlie spotted those glasses in Parent's car and moved them to the trunks in the house, it wouldn't surprise me a bit. Charges most likely would have been Attempted Murder, possibly pled down to Assault and Battery, along with a Robbery charge. Things were different then, so enhanced charges were not typically filed. 15-20 on the Attempted Murder with parole in 10-12. Assault charges 5-10, parole possibly in 7. In re the glasses, there are other photos that show the glassses still on Steven Parent while laying in the car. The glasses found in the house were checked against all victims, both against prescriptions, as well as the actual fit of the frames, and they did not match any of them. I think if Steven Parent hadn't been killed, then Linda Kasabian would have ended up inside the Tate house. I don't believe she stayed outside by her own accord. I believe Tex told her to keep look out because the gun shots could have (should have) aroused a neighbor. I do think Charlie planted the glasses on the trunks. Seems strange that he would plant glasses that resembled Steven's. But I guess those glass frames were popular back then. The LAPD had a hard time identifying Steve Parent. In fact, I think it was the Priest who came to the Parents' door and told them about Steve. I don't know why they didn't just run the plate. It belonged to Steven's Dad. BTW, the ban Charlie had against glasses has evidently been lifted. Charlie wears them now. It's funny how if he needs them, then they're okay to wear. Revatron, good point. You could very well be right. They didn't need a lookout the next night. Thanx for the info about the glasses. I suppose it may be possible Parent or his dad may have had a pair "spare" glasses laying in that car on the dash, or in the glove box. Wikipedia says Parent was driving his fathers 1966 white AMC Rambler. Those glasses were common in those days, I wore a pair very similar. I still can't get past the similarity between Parents glasses, and the unidentified ones. I'm a bit skeptical of any "police checking" surrounding this case. Wikipedia also says, "As Parent was carrying no identification when his body was found, for a short time he was known to authorities only as 'John Doe 85.' The body was identified later that afternoon by the Parent family's parish priest, who went to the coroner's office after Parent's family had informed him that he was missing." Sunset I believe the Priest went to the Parent's house and told them Steve was dead. That's how inept the police were. Like I said, they could have run the plate and immediately known Steve's address and notified his parents on Saturday morning. 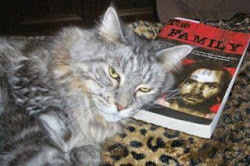 And for those who like to believe the Tate killings were "copy cat killings" to get Bobby off, think again. There's was nothing copy cat about them at all. The only similarity between Hinman & Tate was writing something in blood. Otherwise it was completely different. No phone lines cut at Hinman. Phone lines cut at Cielo. No rope used at Hinman. Rope used at Cielo. Hinman wasn't shot. A shot was fired, but from different gun. Steve, Jay & Voytek shot at Cielo. One victim at Hinman. Five victims at Cielo. 2 cars stolen at Hinman. No cars stolen at Cielo. No drugs found at Hinman. Drugs found at Cielo. No drugs found at Waverly Drive either. The copy cat motive just doesn't hold any water. Sorry. If anyone who believes in the copy cat murders can explain the differences, please do. I'd love to hear them. I don't believe the sole purpose of Tate/Labianca was the copy cat motive, but I do believe the writing on the wall was intended to link the crimes together. I don't believe there is a sole purpose to Tate/Labianca. This thing snowballed out of control starting with Crowe. But my point is, if you're going to link the crimes together, you have to do everything exactly the same. You can't link the crimes together with a non sequitor. A lot of people say that TLB was to get Bobby off the hook. Which is ridiculous. The 3 crimes were totally different. I agree Revatron. I don't think there is a singular purpose to the TLB murders. I think it was a combination of things. Mostly Charlie's anger at not getting a recording contract. Shorty's murder was initiated because Charlie thought Shorty would snitch on them about TLB, having overheard something someone blabbed. Well, I agree and I don't. The writing on the wall really should have been enough. Yes, Tate/Labianca was quite a bit different than Hinman, but Labianca resembled Tate an awful lot. Anyway, I don't think they went to Tate/Labianca to get Bobby out of jail. I think the writing on the wall was intended to send a message, and, if it could get our pal out of jail that would be cool too. Why was Parent's blood found in places other than his car? I guess it would be carried by Tex &/or his knife, from the hand/wrist slashing he dished out to Steven before he was shot? .......Where was the blood found elsewhere then? I've never seen a blood map that included Parent's blood. I haven't either Revatron. Josh, where is this blood?